Cheyenne Chapman Rudolph, Personal Pea Eater, Still from video. Image courtesy of the artist. Recorded Matter: Ceramics in Motion, features twelve, internationally based ceramic artists integrating video into their studio practice. Organized and curated by Garth Johnson, Arizona State University Art Museum Ceramics Research Center Curator. With the dawn of social media comes a new generation of artists who grasp the power of video not just as a tool to document process, but as an inextricable element of their work. Recorded Matter is an exploration of the range of expression that video offers – from viral videos showing artworks being used (or more often, abused) to mysterious inquiries into material and philosophical properties of clay. Physical objects accompany several of the videos showcased in the exhibition. One of the most powerful examples is Recycled China by Thomas Schmidt and Jeffrey Miller, who are both Americans who taught and made work in China. During their time together in China, Schmidt and Miller started crushing cast-off plates (taken from the virtually limitless supply in the porcelain capitol of Jingdezhen) with a steamroller. The crushed porcelain shards were then taken to an industrial foundry and smothered in molten aluminum. The resulting tiles are both mysterious and ethereal – delicate porcelain shards are suspended like sedimentary rocks in a primal, metallic ooze. The 5-channel video of their process recently helped win a Bronze Prize in the Korean Gyeonggi Ceramic Biennial, perhaps the most prestigious exhibition of its kind. Schmidt is a North Carolina-based artist currently teaching at University of North Carolina, Charlotte. Click here to read a recent article in Ceramics Monthly. There are other videos that are self-contained. This Amorphous Moment, by Philadelphia-based artist Jason Lee Starin is an extreme close up of pair of hands squeezing and kneading clay, illuminated only by flickering firelight. Without using any narrative structure, Starin’s video conveys the primal qualities that have attracted humans to clay over the millennia. On the other end of the spectrum is Cheyenne Chapman Rudolph, a Florida-based artist who has connected the rich history of single-function ceramic objects (such as pickle stands and salt cellars) and their modern-day equivalent, the As Seen on TV gadget. For her graduate thesis at University of Florida, Miller created a device to help people in white pantsuits from staining them while eating green peas. 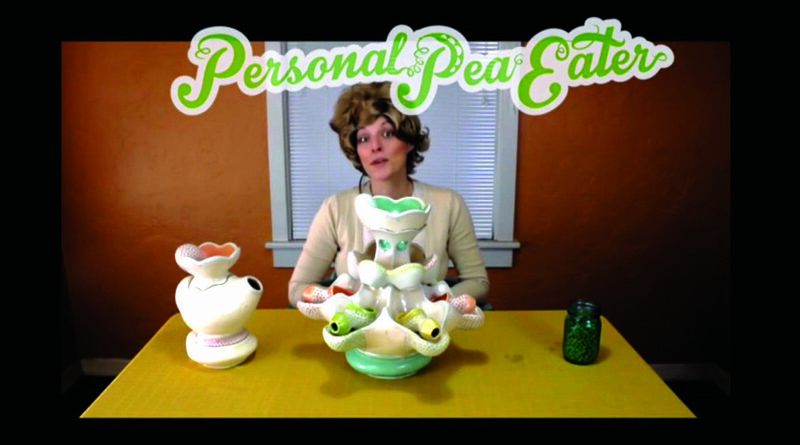 The resulting contraption, Center-Peas is accompanied by an infomercial featuring the artist as pitchwoman, out to convince late-night viewers that thanks to Center-Peas, their “pea mess” problems are a thing of the past. Featured artists include: Jonah Amadeus, Sam Brennan, Forrest Sincoff Gard, Ben Harle, Jo Kamm, Roberto Lugo, Jeffrey Miller and Thomas Schmidt, Cheyenne Chapman Rudolph, Jason Lee Starin, Eva Vogelsang and Man Yau. This exhibition is supported by the Urban Foundation #4, in the memories of Danny Greenlaw and Brooks Collins.